Straw from agriculture could play an important role in the future energy mix for Germany. Up until now it has been underutilised as a biomass residue and waste material. These were the conclusions of a study conducted by the TLL (Thueringian regional institute for agriculture), the DBFZ (German biomass research center) and the Helmholtz Center for Environmental Research (UFZ). According to them, from a total of 30 million tons of cereal straw produced annually in Germany, between 8 and 13 million tons of it could be used sustainably for energy or fuel production. This potential could for example provide 1.7 to 2.8 million average households with electricity and at the same time 2.8 to 4.5 million households with heating. These results highlight the potential contribution of straw to renewable sources of energy, scientists state in the peer-reviewed scientific journal Applied Energy. For their respective study, scientists analysed the development of residual substances resulting from German agriculture. Accounting for 58 per cent, straw can be regarded as the most important resource, and yet so far it has hardly been used for energy production. From 1950 to 2000 there was a noticeable rise in the cultivation of winter wheat, rye and winter barley in Germany which then remained relatively constant. To remove any bias from weather fluctuations, the average values were taken from 1999, 2003 and 2007. On average, approx. 30 megatons of cereal straw per year were produced in these years. Due to the fact that not all parts of the straw can be used and the fact that straw also plays an important role as bedding in livestock farming, only about half of these 30 megatons are actually available in the end. It must be taken into consideration that cereal straw plays an important role in the humus balance of soils. For this reason some of the straw must be left scattered on the agricultural land to prevent nutrients from being permanently extracted from the soil. To calculate the humus balance of soils three different methods of calculation were tested by the team of scientists. Depending upon the method of calculation used, 8, 10 or 13 megatons of straw can be used sustainably every year for energy production – i.e. without causing any disadvantages to the soils or other forms of utilisation. "To our knowledge this is the first time that a study like this has been conducted for an EU country, demonstrating the potential of straw for a truly sustainable energy use, while taking into account the humus balance", stresses Prof. Daniela Thraen, scientist at the DBFZ and the UFZ. It can thus be said that straw can contribute to the future energy mix. The degree to which it will contribute to greenhouse gas reduction however will depend on how the straw is used. A reduction compared to fossil fuels can be somewhere between 73 and 92 percent when using straw for the generation of heat, combined heat and power generation or as second-generation biofuel production. The different greenhouse gas balances cast a differentiated light on the EU´s goal of covering ten percent of transportation sector's energy use by using biofuels. Once again the study emphasizes how the use of bioenergy needs to take into account various factors. Given the conditions prevalent in Germany, the use of straw in combined heat and power generation would be best for the climate. "Straw should therefore primarily be used in larger district heating stations and/or combined heat and power stations, but technology must be developed for an environmentally-friendly utilisation", stresses Dr. Armin Vetter from TLL, who has been operating a straw-fuelled power station for 17 years. According to the summary of the new study, straw-based energy applications should be developed in Germany in particular in those regions with favourable conditions and appropriate power plants. Even if we wouldn't be spinning straw into gold in the foreseeable future, it would still make an important contribution to the energy turnaround. Looking across the border shows us what is feasible when the course is optimally set: currently Denmark is still considered to be the world leader in straw-based energy applications. 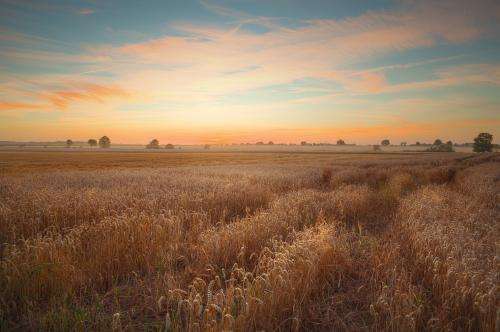 15 years ago a master plan was introduced there, ensuring in the meantime in Germany´s northern neighbouring country that over 5 billion kilowatt hours of energy per year is generated from straw. How much mileage do you get from sawdust? "Due to the fact that not all parts of the straw can be used and the fact that straw also plays an important role as bedding in livestock farming, only about half of these 30 megatons are actually available in the end." Apparently, this scheme has not been contemplated to its very end. The straw can be used completely; 50% directly and 50% indirectly. The straw, used for bedding livestock (manure), can be turned to methane gas in a bio gas plant. Hence, 100% of the available straw can be used and not only 50%.